My husband of 37 years passed away 2 weeks ago and tonight as I realize that 3 years ago I heard the words no one ever wants to hear: your husband has brain cancer. Remember When reminds me of our marriage, it was hard but we had each other; just when we thought we had it all, life as we knew it was changed forever. Now I will carry on and live for our children and grandchildren. we will be celebrating our 50th wedding anniversary on july 18th2015 this song fits perfect we are going to sing it to each other when we renew our vows . brings back alot of special memories. time has gone by so fast Beutiful song !!!! Been married 45 years and was looking for a song with meaning to sing as a solo for our next concert, to relate to my husband. I belong to a choir of young 18 plus women, being 66 and young at heart, grandmother of 7 beautiful children, survivor of breast cancer, life is good! My friend said if I gave him a song he would parody it... I gave him this song and after listening to it ,with tears in his eyes, he said sorry but I can't, not this one. He left the room and cried. I'm not much of a country music fan, but this is a beautiful song and lyric. I heard it on a 30 sec spot on tv and can't get it out of my head.My wife of 43 years love it too, sounds just like us. My favorite country song of all time. Guys don't like to admit to crying...But this is an emotional master piece. A work of art, very touching, deeply moving, a country spiritual and yet so much. This song was played at my sister-in-law's funeral. there was no dry eye. Beautiful song and so fitting. My wife of 34 +years was diagnosed with Alzheimer's when she was 53 years young, she will be 62 in a few days, this is one of her favorite country songs. 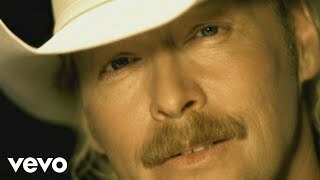 Loves Alan Jackson, I am almost jealous.. LOL.. Thanks for a great collection of your amazing songs over your career. God bless you and your family..
song written with passion. Thank you Alan Jackson! The best song ever, AJ sings the most heart touching songs ever. Bless Him. He gives life a meaning thru songs.